Within Pokemon Sun & Moon, one of the Trials apart of the Island Challenge was held at the peak of Wela Volcano. Though this appears to remain true in Pokemon Ultra Sun & Ultra Moon, there will be at least one new change this time around. 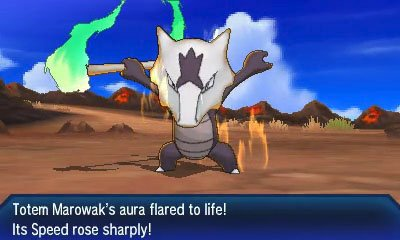 Instead of having to battle and defeat Salazzle as the Totem Pokemon, players will face off with Totem Pokemon Alolan Marowak in order to complete this given Trial. Araquanid, Togedemaru, Ribombee will also be new Totem Pokemon.